Healthy at Hopkins Breakfast - No Trans Fats in any items. Each item will list, Saturated Fat, Calories and Sodium levels. Healthy at Hopkins Breakfast Packages - No Trans Fats in any items. Each item will list, Saturated Fat, Calories and Sodium levels. Healthy at Hopkins Snack Break - No Trans Fats in any items. Each item will list, Saturated Fat, Calories and Sodium levels. Healthy at Hopkins Lunch Packages - No Trans Fats in any items. Each item will list, Saturated Fat, Calories and Sodium levels. Healthy at Hopkins Cold Lunch Options - No Trans Fats in any items. Each item will list, Saturated Fat, Calories and Sodium levels. Healthy at Hopkins Hot Lunch Options - No Trans Fats in any items. Each item will list, Saturated Fat, Calories and Sodium levels. Healthy at Hopkins Box Lunches - 1/2 Sandwich, Greek vegetable salad or baked chips/pretzels, whole fruit or fruit salad cup Calories:425 Saturated Fat:2.4g Sodium:365mg Serving Size- One Box Calories have been rounded to get a general basis for the box to make ordering easier. There are two "Whole" Sandwich options that fit in the "Green Light" category. No Trans Fats in any items. Each item will list, Saturated Fat, Calories and Sodium levels. Healthy at Hopkins Salads - Dietary information included. No Trans Fats in any items. Each item will list, Saturated Fat, Calories and Sodium levels. Healthy at Hopkins Sides - No Trans Fats in any items. Each item will list, Saturated Fat, Calories and Sodium levels. Healthy at Hopkins Desserts - Nutritional information included. No Trans Fats in any items. Each item will list, Saturated Fat, Calories and Sodium levels. Includes chafing dish, wire racks and sternos. A variety of colors offered. Please put in the desired number servers in the box. Time includes set up and breakdown of event. Good Mornings! Summer Breakfast - Available until September 21st. Summer Shack Sandwich Platter - All Sandwiches served with mayo, mustard & house made pickles. Available now through September 21. Priced per person. Minimum of 10. Please choose sandwich selection below. Summer Green Salads - A perfect match for our Summer Sandwiches! Available now through September 21. Minimum of 10. Spring Mix, berries, green onions, avocado and chevre, Sweet Mustard, Lime Cilantro or Green Goddess dressing. Summer on the Grill - Available now through September 21. Summer Sides - Available now through September 21. Minimum of 10. It’s That Time of Year! Our Famous Corn & Avocado Salad is back! Minimum 10. Choice of Berry Shortcake or Dirt Pudding. Breakfast Items - Try one of our house made muffins or a hot breakfast with local, cage free eggs and locally farmed bacon and sausage! Energize your daily meetings with a Greek yogurt parfait or house made granola. Assorted house made mini blueberry and coffee cake muffins (varieties vary seasonally) with fresh bagels with cream cheese. Price per person with a 10 person order minimum. A selection of sliced seasonal fruits and berries. We proudly use Maryland fruits April – October! Serves 10-15. A selection of sliced seasonal fruits and berries. We proudly use Maryland fruits April – October! Serves 20-25. A selection of sliced seasonal fruits and berries. We proudly use Maryland fruits April – October! Serves 30-40. Price per person with a 10 person order minimum. Assorted individual yogurts including Chobani Greek and Yoplait branded yogurt with our homemade granola topping Price per person with a 10 person order minimum. Organic agave and local honey Greek yogurt mix, homemade granola and seasonal fruit. Price per person with a 10 person order minimum. A delicious breakfast packed into one dish! Local eggs with your favorite filling baked to perfection, sliced and served hot. Remember it's gluten free. Select type from options menu below. Want to keep it hot? Add a chafer from our "extras" section. Think breakfast skillet for your whole meeting! Our local, cage free eggs with potatoes (local May - November), Berkshire sausage and aged cheddar. Want to keep it hot? Add a chafer from our "extras" section. Local eggs, cheese with either local bacon or local sausage in a flour wrap or Terra Roll. Served with our spicy ketchup. Want to keep it hot? Add a chafer from our "extras" section. Local eggs seasoned and scrambled. Want to keep it hot? Add a chafer from our "extras" section. Local, nitrate free bacon - 3 slices per person. Want to keep it hot? Add a chafer in our "extras" section. Local Berkshire sausage. Want to keep it hot? Add a chafer in our "extras" section. Roasted local bacon and local Berkshire sausage - 2 bacon, 1 sausage link pp. Want to keep it hot? Add a chafer to your order in our "extras" section. 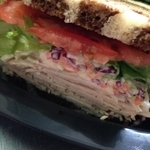 Free Lunch for Orderer - We would be very happy to bring you a sandwich or salad with your meal order. We want you to have a chance to enjoy J. Burke Catering with the rest of the gang. Please choose a sandwich or salad and it will be accompanied with a cookie and chips. Please enjoy a complimentary Box Lunch on us! Please specify in Special Instructions if you would like a sample of any of our Seasonal Sides. Please note which salad you would like. Thank you for choosing J Burke Catering! 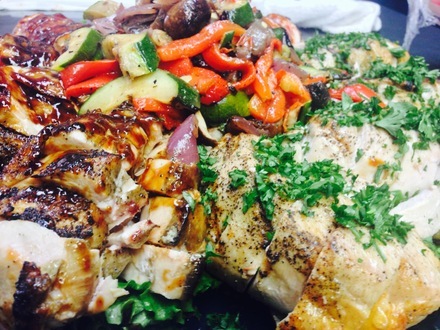 Grill Platters - Minimum of 10-Our produce is local from April – October (with the exception of bell peppers and some lettuce) Our chicken and beef are provided by Fells Point Meats and we offer all natural Mountaire Delaware chicken and Creekstone Farms beef. Grills and Greens - A great alternative to sandwiches!! A great alternative to sandwiches! Pick one of our Specialty Salads and three choices of proteins. A great alternative to sandwiches!! Pick from one of our Signature Salads and a choice of 2 proteins. Select a custom assortment of JBC's traditional sandwiches and wraps from the options menu below. Sandwiches served on San Diego style torta rolls. Select a custom assortment of JBC's signature sandwiches and wraps from the options menu below. 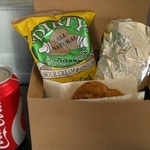 Box Lunches - Box includes sandwich, potato chips, choice of drink and a cookie or brownie. All sandwiches include lettuce, tomato, Mayo and Dijon. Price per person with a 10 person order minimum. Lunch box includes potato chips, a cookie or brownie, and a beverage. If you would like to upgrade your side from chips to a signature salad please choose your upgraded side below. Select a custom assortment of JBC's Traditional Sandwiches and Wraps from the options menu below. If choosing multiple box lunches please specify needs in the special instruction box below. 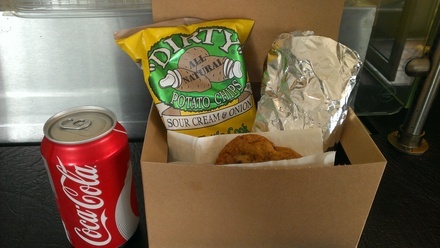 Lunch box includes potato chips, a cookie or brownie, and a beverage. Select a custom assortment of JBC's Signature Sandwiches and Wraps from the options menu below. If choosing multiple box lunches please specify needs in the special instruction box below. Our deluxe lunch boxes with a salad option instead of sandwiches! All are Gluten Free, just add Gluten free dressing to make it complete. Try lasagna our way! Individual lasagna noodles rolled up with your choice of filling and topped with house marinara and mozzarella. Minimum order of 10 please. Organic mixed greens, dried cranberries, honey chevre and balsamic vinaigrette. Add Grilled Chicken as a salad topper for an additional fee per person. Organic mixed greens, shredded carrots, cucumbers and tomatoes. Add Grilled Chicken as a salad topper for an additional fee per person. Cavatappi with spinach pesto and sun dried tomatoes. Want to keep it hot? Add a chafer from our "extras" section How about a mashed potato bar? Add the option to have nitrate free bacon, shredded cheddar, sour cream, scallions and broccoli served on the side. Our house braised pulled pork and potato slider rolls. 2 sliders per person. Requires 48 hours notice. Stoney point farm bacon, puff pastry, brown sugar, Rosemary....Amazing! About 1.5 straws per person. Priced per piece. Minimum order of 20 please. Serves 10-15. Jumbo Shrimp Platter with Shrimp Cocktail and Sweet Herb and Garlic Shrimp. Serves 20-30. Jumbo Shrimp Platter with Shrimp Cocktail and Sweet Herb and Garlic Shrimp. Serves 40-50. Jumbo Shrimp Platter with Shrimp Cocktail and Sweet Herb and Garlic Shrimp. Serves 10-15. Season soy marinated grilled chicken and beef with Thai peanut dipping sauce. Serves 20-30. Season soy marinated grilled chicken and beef with Thai peanut dipping sauce. Serves 40-50. Season soy marinated grilled chicken and beef with Thai peanut dipping sauce. Serves 10-15. White Wine marinated button mushrooms, orange balsamic and rosemary roasted red peppers, sesame olives, and balsamic grilled vegetables (vegetable vary seasonally). Serves 20-30. White Wine marinated button mushrooms, orange balsamic and rosemary roasted red peppers, sesame olives, and balsamic grilled vegetables (vegetable vary seasonally). Serves 40-50. White Wine marinated button mushrooms, orange balsamic and rosemary roasted red peppers, sesame olives, and balsamic grilled vegetables (vegetable vary seasonally). Serves 10-15. Imported and domestic cheese, homemade spreads, with fresh berries and assorted crackers. Serves 20-30. Imported and domestic cheese, homemade spreads, with fresh berries and assorted crackers. Serves 40-50. Imported and domestic cheese, homemade spreads, with fresh berries and assorted crackers. Serves 10-15. Assorted rollups of grilled "pit" style roast beef, hand carved turkey and honey mustard, grilled vegetables and hummus spread all served with lettuce and tomato and sliced into silver dollar sized pinwheels. Serves 20-30. Assorted rollups of grilled "pit" style roast beef, hand carved turkey and honey mustard, grilled vegetables and hummus spread all served with lettuce and tomato and sliced into silver dollar sized pinwheels. Serves 40-50. Assorted rollups of grilled "pit" style roast beef, hand carved turkey and honey mustard, grilled vegetables and hummus spread all served with lettuce and tomato and sliced into silver dollar sized pinwheels. 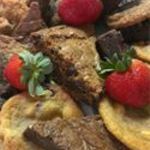 Chocolate Chip Heath Bar Cookies, Oatmeal Raisin Cookies, Double Fudge Brownies, Cream Cheese Brownies, Blondies and assorted seasonal cookies. The old classic. They're not just for kids! Select type from the options menu below. A selection of sliced seasonal fruits and berries. Serves 10-15. A selection of sliced seasonal fruits and berries. Serves 20-25. A selection of sliced seasonal fruits and berries. Serves 40-50. Fresh Squeezed Florida Orange Juice, it's the best juice you'll have! - 1 gallon. 16 8oz pours of OJ. Beer/Wine/Alcohol - You must add a service person to request these items. Up to 5 hours of total service to include set up and breakdown of event. Food is always delish and ever changing seasonally. I love the variety J Burke's offers. The oriental noodle salad can't be beat. Really good food & service. We have never had a bad order from J. Burkes! Their Grills and Greens platters are GREAT! I should have just ordered the salads - they were a huge hit! Sandwiches, not so much, as they were very dry. The fall dessert tray was excellent as well. Food from here is always incredible and they are always on time. The options are unique and fresh which makes for a great choice!! Great service and food at an affordable price! Even delivered earlier than expected. The food was ok and when delivered it was not hot although it was in a hot box. They gave us one container of salad dressing for more than 150 people. We did not receive the bang for our buck. Ordered breakfast for 15 people. They arrived right on time and the food was so delicious! Looking forward to working with them again. The food was good, but the portions were small. The food was very good and every time I use J Burke the food is delicious. My complaint this time was with the delivery. First off the delivery was 15 minutes late, so food did not arrive until our event was already starting even though I ordered the food on the 15 minute buffer as instructed when ordering. However my main complaint is that the young woman who did the delivery called me and asked me if I could meet her at the front door to pick up the food instead of her deliver it to the meeting room we were in. I am 9 months pregnant so this was not an option for me, but I was very put off by this request considering we were already charged a delivery fee AND tip when placing the order. Additionally, every time we have ordered from J Burke in the past they send someone familiar with Hopkins hospital so having to come get the food at the front door is never an issue. The young woman delivering the order didn't even bring a cart with her so she ended up wheeling the food into the room on a borrowed hospital wheelchair, which obviously looked less than professional/sanitary. Finally, we ordered coffee and this delivery person did not bring sweetener for the coffee, which was a noticeable oversight as well. I was very surprised with this experience because I had just had another delivery from J Burke last week with no issues at all. I was very disappointed in today's delivery - it was not at the level I expected from J Burke as I've had good experiences in the past. I always get compliments on the food when I order from Joe Burke's. Some of our favorites are the Salmon, Asian salad and corn/avacado salad! Great customer service. Our delivery person was very gracious and professional! The food was amazing! A place you definitely want to have cater your event(s)! Eveyone at my company loves the quality of service and food. They enjoyed thier meals and we will definitely be using them again! We ordered a special catered dinner and it was great! Thanks for all the food! We ended up with more than we needed, but they did great! Everyone loved the salmon and greens. Nice food trays but consistently show up 30 minutes late or not at all. Will never order from them again. Very nice option instead of sandwiches. The food was really good. Delivery person arrived on time. Oriental Pasta Salad is Fabulous! A great change and delicious flavors for lunch!! i did warm up my chicken, platter, but that is my preference. They loved it!!!! I will not be ordering from J. Burkes anymore. I ordered 2 salads and meat toppings for 22 people (Grills & Greens) and the salads were VERY SMALL. Also, I ordered 22 dessert cookies and they only brought me 18. Then when the manager called to follow up with me she argued with my concerns and told me I was wrong and next time I need to order accordingly. MIND YOU THIS ORDER COST $438.00. You think they would be a little nicer to their high paying customers. Never again! Food was delicious and tasty, but very small portions. They could benefit from displaying the food spread in larger containers. J Burke has always been great to work with; each time someone comes to deliver to our office, they are always so friendly. They have a wonderful variety of food and everything is fresh and delicious. J Burke is always a staple in our office and they never disappoint. THANK YOU !!!!! EVERYONE LOVED THE FOOD AND THE SERVICE WAS AWESOME!!!! Great Staff and Good Food! DELICIOUS FOOD EVERYTIME, ORIENTAL PASTA SALAD IS AMAZING!! They arrived late, and did not provide any salad dressing. The group was very disappointed. Just had breakfast catered and I met the owner! Food was amazing and everyone loved it. Fresh and delicious - will definitely use this company again! On time delivery. 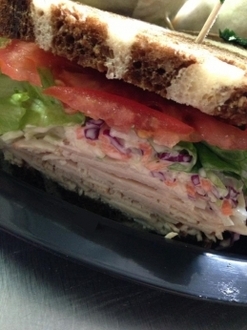 Fresh sandwiches and great service. The sandwiches, salad and desserts were excellent. This group usually does not give much feedback on caterers but they definitely liked everything about J Burke!! Our company loves J. Burke Catering. We have used them for breakfast and lunch menus. Everything tastes great, and arrives on time. A great caterer!!!!! Upgrading from my last review. this order was better!! Joe Burke is one of my favorite caterers because, quite simply, he is the best. 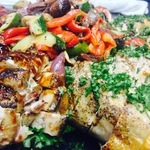 They cater mostly our higher-end client meetings and we have a lot of clients who say how much they love the food and when they come back, they request J Burke again. The excellent grilled meats and fresh salads are a big hit and an awesome alternative to sandwiches at lunch. Best of all is the personal attention and great customer service- they are accommodating and helpful and strive to get it right the first time and every time after.They have also handled several special events and full- service catering events for us and every time people raved about the food and the service. They are my go- to any time i want to impress. I highly recommend this company. The food was amazing and the presentation was awesome. I can always count on them for great service. J. Burke's Catering ALWAYS does an awesome job. The food is fresh with great taste, and the delivery was timely and accurate. The only small thing with this particular order was in the General Instructions I asked for no onions on any sandwich or salad. The Pasta Primavera had a lot of onions all through it. No one was allergic, it is just they have a strong smell in a closed room for a two hour meeting. Other than that everything was great. I would DEFINITELY order from them again. I was very pleased with my order. The lady that delivered was extremely friendly.